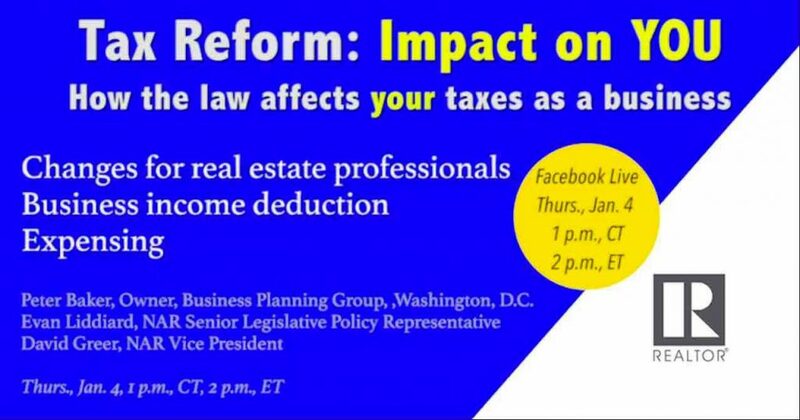 The National Association of REALTORS® (NAR) worked throughout the tax reform process to preserve the existing tax benefits of homeownership and real estate investment, as well to ensure as many real estate professionals as possible would benefit from proposed tax cuts. The final bill includes some big successes. Many of the changes reflected in the final bill were the result of the engagement of NAR and its members, not only in the last three months, but over several years. In fact, former CABR President and 2017 President of the Ohio Association of REALTORS® Pete Kopf was part of a contingent of REALTOR® members who flew in to Washington D.C. and met with members of Congress’ conference committee such as Ohio’s Senator Rob Portman. In their meeting, Senator Portman committed to keeping the exclusion of gain on sale of a principal residence in the final bill, in addition to other issues important to NAR, our members and our clients. Click here to read a summary of provisions of interest to NAR and its members. Keep in mind, the examples provided in NAR’s summary are for illustrative purposes and based on a preliminary reading of the final legislation as of December 20, 2017. Individuals should consult a tax professional about their own personal situation. Want to Learn More About How YOUR Taxes as a Real Estate Professional Could Be Impacted?